On Friday 15 July 2016, we were delighted to welcome Jeremy Mayhew – Chair of Finance Committee at the City of London Corporation and former Chair of the City Bridge Trust – and David Farnsworth – Director and Chief Grants Officer at the City Bridge Trust to the Bridge. 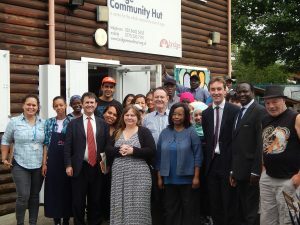 The City Bridge Trust awards around £20m per year to charitable causes in London and during the visit the two top officials met over 30 beneficiaries and joined in our ‘Grow it and Cook it’ project activities that they funded in 2015 for a three year period. They also spent time talking to the Bridge Chair and senior management and agreed ways in which we can work together to develop a stronger voluntary and community sector in Haringey.